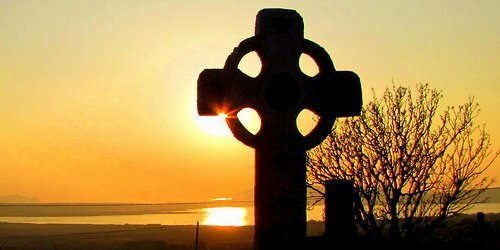 The Celtic Cross is a beloved symbol of Ireland. These stone crosses, with a characteristic ring surrounding the central intersection, can be found abundantly in Irish graveyards, but also dotted around the Irish countryside, sometimes in the most unexpected places. Often intricately decorated with interlacing motifs, some early examples date back to the 8th century. 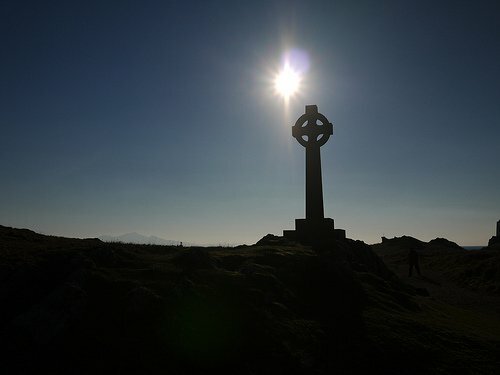 As a tribute to Easter, I thought I might share some beautiful images of Celtic Crosses from Ireland and around the world. To be considered a Celtic High Cross the ornamental monument must be at least 800 years old. Any younger and the cross is simply a Celtic Cross. 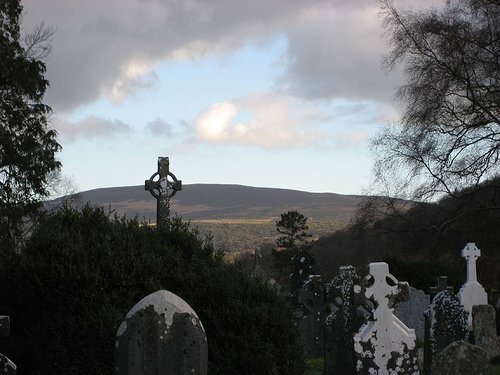 The picture above was taken in Glendalough, the ancient monastery of St. Kevin in Co. Wicklow which dates back to the early years of the 7th century. 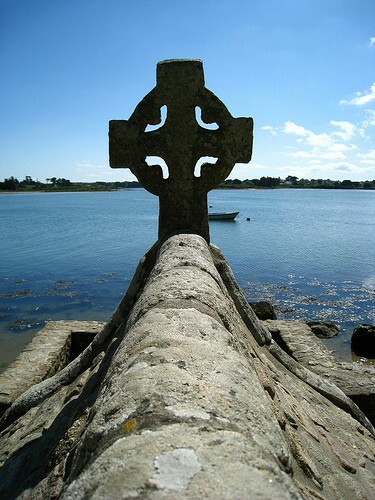 Ireland was once known as the “island of saints and scholars.” This cross is located in Clonmacnoise on the banks of the river Shannon. This great center of learning was founded between 545 and 548. This High Cross is ornately carved and decorated. 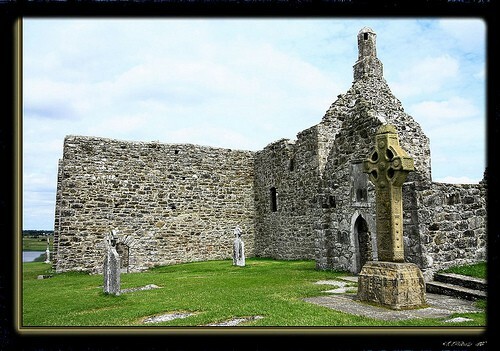 The original High Crosses at Clonmacnoise have been moved into the visitor’s center for preservation purposes. Replicas of the originals now stand in their place. As with all things Irish, legends abound regarding the true origins of this iconic symbol. One such ancient tale tells how St. Patrick created the cross to assist him in converting the pagan Irish to Christianity. He combined a traditional Latin cross with the circular, pagan, moon Goddess symbol to help underscore the power of Christ over the moon and the sun. The circle of the cross is also considered a symbol of eternity and God’s infinite love. Others believe it represents Christ’s halo or the circle of life. 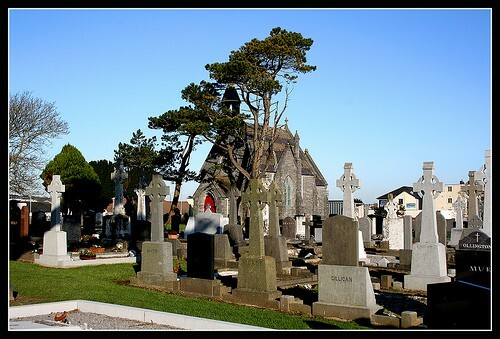 This photo of an Irish graveyard clearly underscores how much Irish people embrace this symbol of their faith. 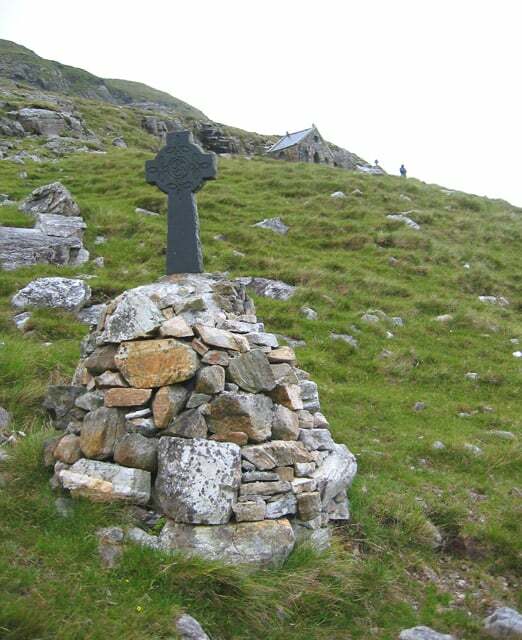 Celtic crosses can be found in rugged, out-of-the way places such as this Station of the Cross found on the side of a hill in the Mamturk mountains in Co. Galway. 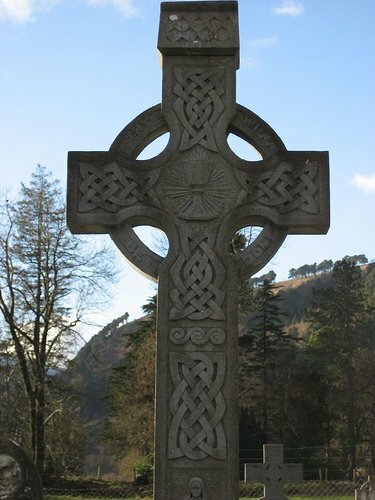 Celtic crosses are found throughout the British Isles, especially in Cornwall, Scotland and Wales, all Celtic regions. This amazing photo at sunset is from Wales. 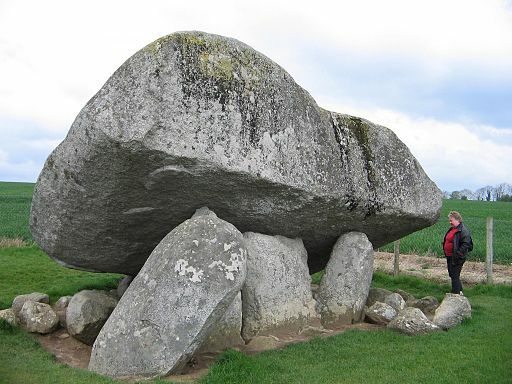 The example above can be found in Brittany in France, which is considered one of the six Celtic nations (Brittany, Cornwall, Ireland, Isle of Man, Scotland and Wales). 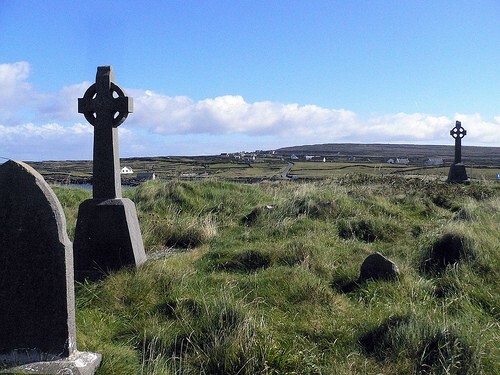 Wherever the Irish have roamed, settled and passed on to the next life, they have brought their Celtic crosses with them. 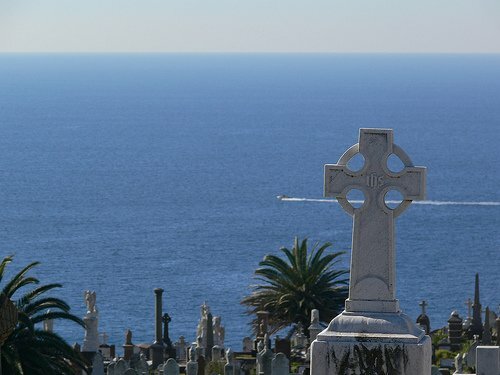 This image is from a cemetery in Australia. 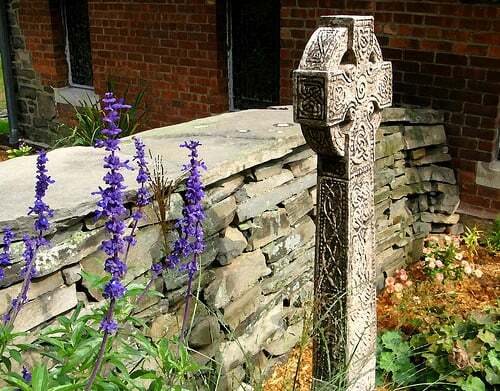 Here is an example of a Celtic cross in New York State. The Celtic cross gives inspiration to jewelery designers today, and is used extensively by tattoo artists. How this symbol is evolving and being embraced as a modern day emblem highlights its great power and meaning. New interpretations can never erase its history and iconic connection to our forefathers. 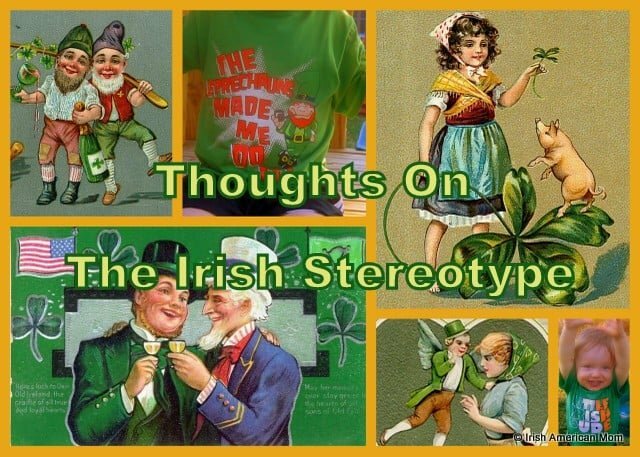 And so, to all who choose to proudly wear a Celtic Cross, do not merely think of it as a modern symbol of today’s culture. 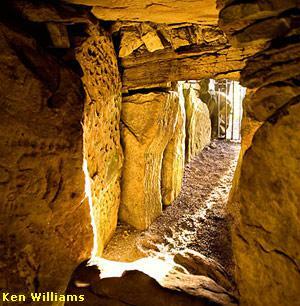 Always remember it symbolizes Celtic folklore, our Christian heritage, and deeply roots us to our ancient past. P.S. Thank you to all the wonderful and generous photographers who so graciously share their amazing works under a creative commons license. “Deeply roots us to our ancient past”…what a lovely, lovely post. Happy and Blessed Easter to you. Easter blessings to you and your family too, Kay. 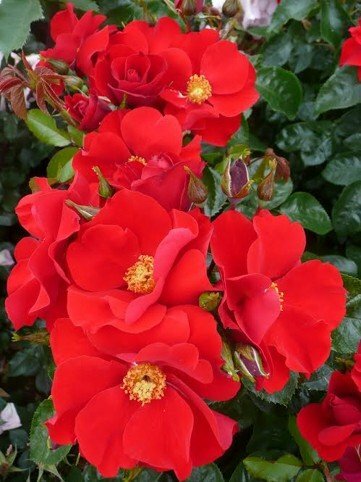 I hope you have a lovely weekend. Happy Easter, When I first opened my shop a fella asked me what the meaning of circle of the celtic cross. I told him I wasn’t sure but would find out for him, when he realized I wasn’t going to fake my way through an answer he proceeded to informed me of the different meanings , which you so accurately stated. 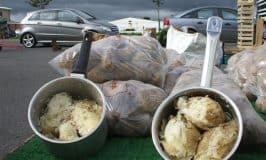 Thanks again, and from reading your site I know you will have a lovely spread for your Easter feast. Brian – I hope you and your family have a lovely Easter too. Best wishes! The circle of life often describes a community coming together. The symbol existed in pre-christian times too in the form of stone circles and markings from neolithic times representing the Sun. This was later adapted as a christian smbol along with many other old pagan customs and beliefs. 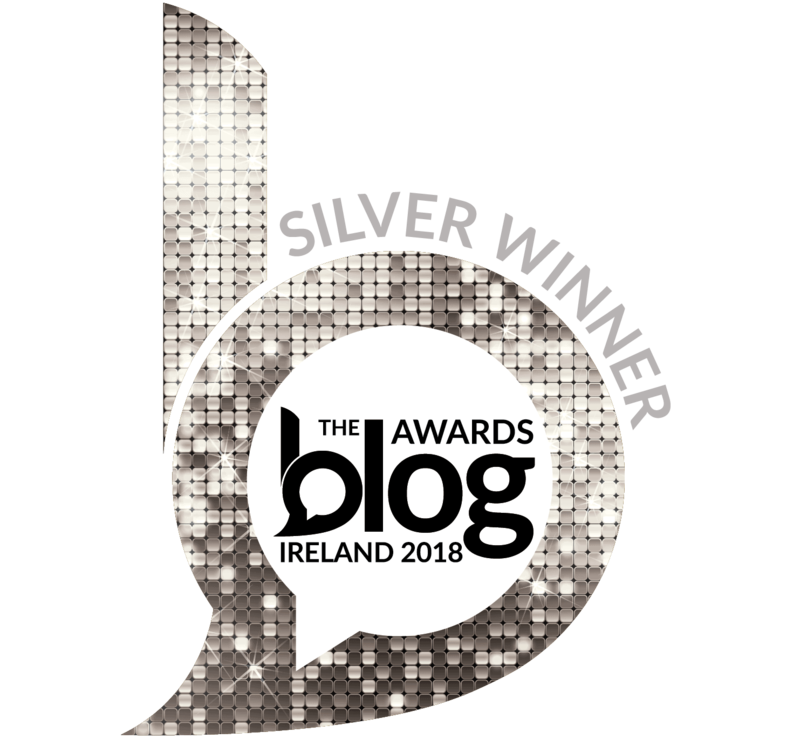 Chris – Thank you for adding this information about the circle of life and how the circle is an important pre-Christian symbol of pagan Ireland, adapted and incorporated into christian emblems of a later era. Thanks so much for vising and commenting. The 7th Celtic Nation is Galiciia in Spain . Thanks for letting us know about Galiciia in Spain. I was unaware of this one. I wonder if there are any Celtic Crosses there. Hav u seen the Celtic cross in the village of Donaghmore Co Tyrone.it was restored a few years back. I haven’t seen it yet Ciaran, but definitely hope to see it someday when I’m heading towards Donegal where my husband was born. Hi Constance – In 2016 as we celebrated the 100th anniversary of the 1916 rising, there was a renewed interest in all things Irish, including beautiful symbols of my homeland such as the Celtic Cross. And We celebrated the 100th anniversary in Dublin because bein from dungannon.tom Clarke is our hero. Thanks so much for stopping by and adding to our discussion.